D.J.Wright Dairies is a private limited company established in 1963, although the family has been trading as distributors of milk and dairy related products in Bournemouth and Poole for over eighty years. The company has always been run by members of the family, maintaining a high level of service to its customers and continually tailoring its product range to ensure that all products are sourced from reputable manufacturers. This enables the supply of high quality foodstuffs at competitive prices. In 1998 we moved from the heart of Bournemouth to our previous site in Wolterton Road, Poole enabling expansion to a wider customer base whilst upgrading our refrigerated vehicle fleet and continuing to provide a good service to the local catering market. Our maintained strong expansion over recent years has meant that we have now outgrown our Wolterton Road depot. The company is now proudly situated on a one acre custom built site at Concept Park, Poole. 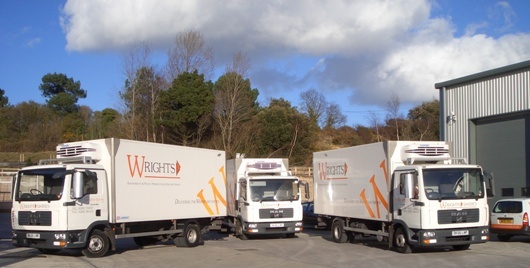 D J Wright Dairies is one of the few remaining independent family run dairy distribution businesses on the south coast today. Our aim has always been to offer our customers a local and flexible, yet first class service based around their catering needs. Over the years we have carefully extended our range of chilled and ambient products to cover even more daily requirements. Most items are available for next day delivery enabling our customers to restock as required rather than weekly. Our new depot allows us to combine modern technology with traditional values, thus enabling us to continue the high level of local service that our customers know and trust.